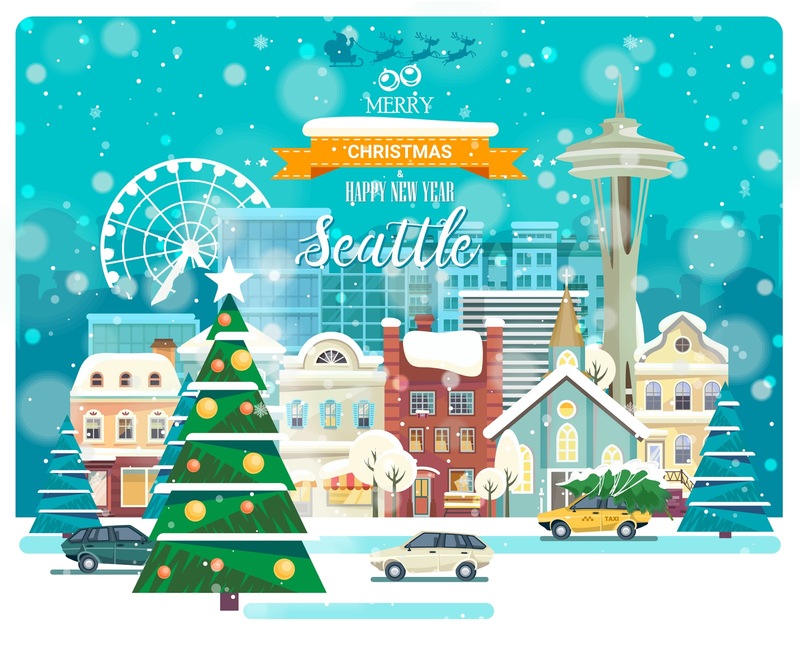 Killer Characters: Happy holidays from Seattle! Hi all, and happy holidays from rainy Seattle! Michael, Bella, Mouse, and I all hope you have a wonderful season. I know not all of you celebrate Christmas, but I also have to add a heart-felt Merry Christmas from me. Christmas in Seattle doesn’t usually contain any of that white stuff sung about in Bing Crosby’s Christmas carols, but the lights hung on the houses more than make up for it. Every December brings back my fondest childhood memories. Dad’s horribly wrapped presents, our always-dry-needled Christmas tree, Aunt Rita’s sickeningly sweet fruitcake. That may not sound like much to the rest of you, but I will always treasure those special times with my family. Things are different now. Bella would shred the wrapping on presents, and Mouse would surely topple a tree. Instead of carols, I’m now serenaded by Michael’s off-key show tunes. Honestly, I couldn’t be happier. Which is why I’m sharing my holiday cheer with all of you. As a special Christmas treat, all of my author friend Tracy’s books are on sale on Amazon. Details are below. The books are in order of publication. Just click on the link to go to the Amazon’s sale page. Remember, books make great Christmas gifts! If Amazon is out of stock on a book you want, e-mail Tracy@TracyWeber.net. She’ll match the price if she has it on hand, and she’ll autograph it to boot! Murder Strikes a Pose: $0.99 on Kindle, $7.99 in paperback. Half price on Audible for Audible members! A Killer Retreat: $1.99 on Kindle, $7.99 in paperback. Half price on Audible for Audible members! Karma’s a Killer: $2.51 on Kindle, $8.00 in paperback. Half price on Audible for Audible members! A Fatal Twist: $2.99 on Kindle, $10.19 in paperback. Should be half price in paperback soon! Pre-Meditated Murder: $2.51 on Kindle, $8.00 in paperback. Oh—and one more present! Comment below about your favorite holiday tradition and you’ll be entered to win a copy of of my next adventure, Murder Likes It Hot, when it's available in January. 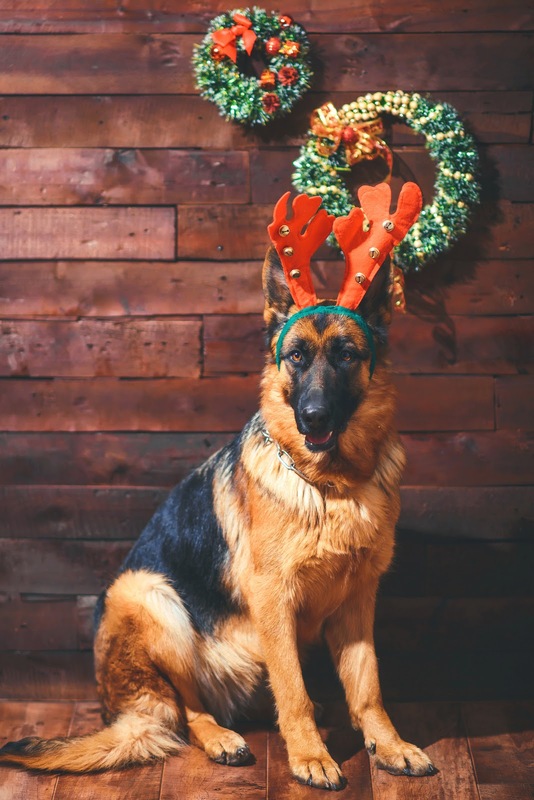 Enjoy, and Bella says Merry Woofmas!! 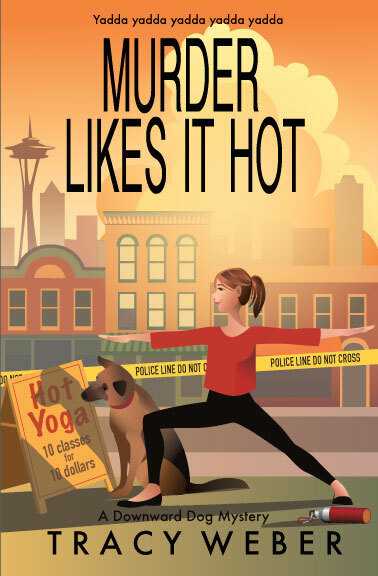 My next mystery, Murder Likes it Hot, will be out on January 8, 2019! Go on, buy yourself a copy. You know you want to. We have Christmas Eve and day in pajamas it’s my favorite holiday tradition. Baking cookies, decorating the apartment and tree and look for the new Santa Mouse ornament! I love the dog. He looks like one we used to have. I love sharing at Christmas. There is so much going on. My favorite holiday tradition is our special Christmas morning breakfast of the sweet rolls like my grandma used to make. Can't wait to read this book! mcastor07 (at) gmail (dot) com. Having the youngest who can read read The Night Before Christmas on Christmas Eve. Merry Christmas! My favorite tradition is baking Christmas cookies and decorating the tree. Thanks all for your comments. Love the traditions shared so far. Good luck! My favorite thing is buying Christmas jammies for my grandsons every year for them to wear all month, but especially Christmas Eve. We celebrate on 12/23 because that is my granddaughters birthday and we dog sit my grand dog on Christmas day Wish I was in Seattle for Christmas because that is where my son is. I love watching the Christmas ships in Portland, OR . The city's tree lighting ceremony. Although our Christmas has changed over the years, it’s good to cherish old memories and create new ones. We just downsized and moved in our new home last year at the opposite end of the state. Been a lot of adjustments including this Christmas decorating since there’s not the room to put up the seven Christmas trees of the past. However, we will have new experiences and joys each year as we celebrate Christmas making new traditions and memories while remembering the past Christmas ones – especially when we put the ornaments on the tree and the meaning behind them to us. Thank you for the wonderful chance to win a copy of "Murder Likes It Hot"! There are so many...listening as my husband mumbles and complains as he sets up tree and string lights, we now know to expect...and laugh and call it the annual cruising of the tree. The night we put decorations on and out, we have tacos for dinner....( I’m from California). There’s making making massive amounts of cookies and candy and giving away to others. The grown kids do not like to bake....lol but grands and great grands join me in these efforts. Let’s see...there’s listening to carols, being together as family and extended family any way we can even if it is face timing...so many things change but the essence is always the same. Love, acceptance, candles, decorations handmade by kids. We always used to go to children’s services, then the kids grew and we advanced to midnight service....followed by getting older and going back to children’s services! Also love sending out Christmas cards. I know many don’t participate in this anymore but I still love it at 71. Our main tradition is baking lots of goodies to share with friends and neighbors. We also drive around to look at lights. Thanks for the chance. I love this series!!! I love decorating the Christmas tree with ALL Of the family. Excited to read the new book! Our tradition is spending Christmas Eve with my family and then either spending Christmas Day with Mark's family or just the two of us. This year it will be just the two of us, and we can't wait! I like to watch Christmas movies on T.V. I love to eat pumpkin pie. I don't have much family, just my parents. A lifelong tradition is to only leave the Christmas lights on all night on Christmas Eve. The winner is Debby236! I'll e-mail to get your address. Thanks, everyone!